Tonight's episode sees Tracy Barlow (Kate Ford) confess to her rival in love, Liz McDonald (Beverley Callard) that she has been having an affair with her boyfriend Tony (Terence Maynard) over the past few months. If that wasn't already bad enough, what makes this worse is that Liz is the grandmother of Tracy's daughter, Amy, making Tracy's betrayal even more shocking. Tracy and Tony's relationship was never going to be a love story with a happy ending, both were using each other and Tracy ultimately wanted to get her hands on The Rovers. However, when Carla (Alison King), Tracy's enemy, buys the remaining half of the pub Tracy is seething and feeling that she has nothing to lose she reveals all to Liz, including her planned deception of buying the pub behind her back and her affair with Tony. Liz is understandably distraught but apart from confiding in Carla she decides to keep the revelation secret from everyone else for the sake of her son Steve, whose marriage to Michelle is about to take place, but Tracy's confession begins a chain of events that leads to an explosive week in Weatherfield. 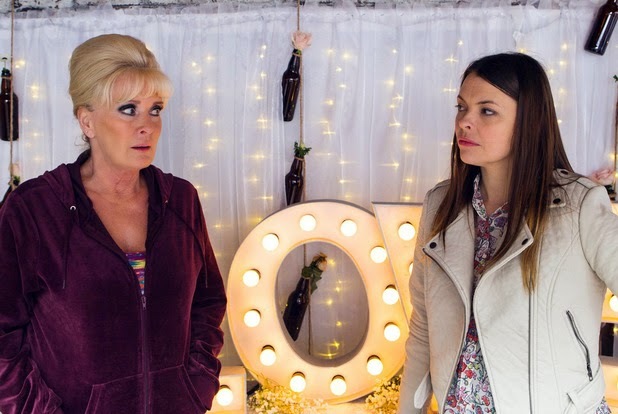 The Custard TV were invited to a special press screening of the episodes last week where we caught up with Kym Marsh who plays Michelle to ask her about her character's imminent wedding to Steve McDonald (Simon Gregson). This week is a big week for Coronations Street, were you worried that the wedding could be overshadowed by the dramatic events? In any good Corrie episode you'll always find that there's massive drama and comedy, so we were quite happy to be the light relief, especially as there is so much drama towards the end of the week. Everyone wanted Steve and Michelle to get married for so long so finally we see that happen. Did you find the wedding scenes emotional to film? I don't think we did actually! We laughed at each other a lot and loved filming it. There are some soppy moments and it was beautiful in places but there were parts of it that were typical Steve and Michelle. We enjoyed it, it was fun. Michelle is the fifth Mrs McDonald.. Do you think their relationship will last? [Laughs] Steve and Michelle have had such a long story. Back when Michelle first arrived in the Street there was a view to her being Steve's new love interest but they didn't want to do that too quickly. Then when they did get together there were things standing in their way and then Steve had an affair with Becky! They've had a roller-coaster relationship, Simon and I always joke they are the Ross and Rachel of Coronation Street, they're the couple that everyone always wants to be together but something always happens and splits them up. It hasn't been plain sailing but ultimately I think there's a reason why they keep being put back together. Viewers saw Steve being diagnosed with depression earlier in the year and subsequently go through a rough couple of months, do you think it's important that he gets a happy ending? I think it's very important. When we first got told we were going to be involved with this storyline we weren't sure that Steve was the right character to do this as he is such a comedy character but it was only further down the line that we realised actually he was completely the right character. Corrie cleverly took a person that everyone thinks is happy-go-lucky and made the audience ask how he could possibly have depression, that was the genius highlighting it, that if someone like him can get depression then anyone can. So the wedding is the start of his recovery? Depression is not a quick fix so we have to see the journey of him hiding it, being diagnosed and then going through all the other things like losing the letters from the tax man etc, all implications of him being unwell. The wedding is his recovery story and part of him getting back to the place where we see his jokes and comedy side again. It's not a happy ending but more of a happy beginning. And finally, new members of the Connor family are heading to Weatherfield (Shayne Ward has recently been cast as Aidan, Michelle's cousin) how do you feel about the family being expanded? Steve and Michelle's wedding takes place tonight and tomorrow and Coronation Street airs at 9pm all this week in an explosive week of episodes. Coronation Street Starts tonight at 9.00pm on ITV.